Two more “single incidents” of the everyday war against immigrants. Last Decmber immigrant street vendors were severly abused by cops during a manhunt in Athens high street, and then at the infamous Acropolis police station. Victims of this story are still detained. A court hearing is tomorrow, March 19. More in this post and this post. SOLIDARITY GATHERING@ATHENS COURTS (Evelpidon str.) MARCH 19, 09.00. Solidarity with immigrant street vendors in Athens! FINANCIAL SUPPORT FEAST FRIDAY, February 5, 2010, ASOEE (Economic Univ., Patision str. 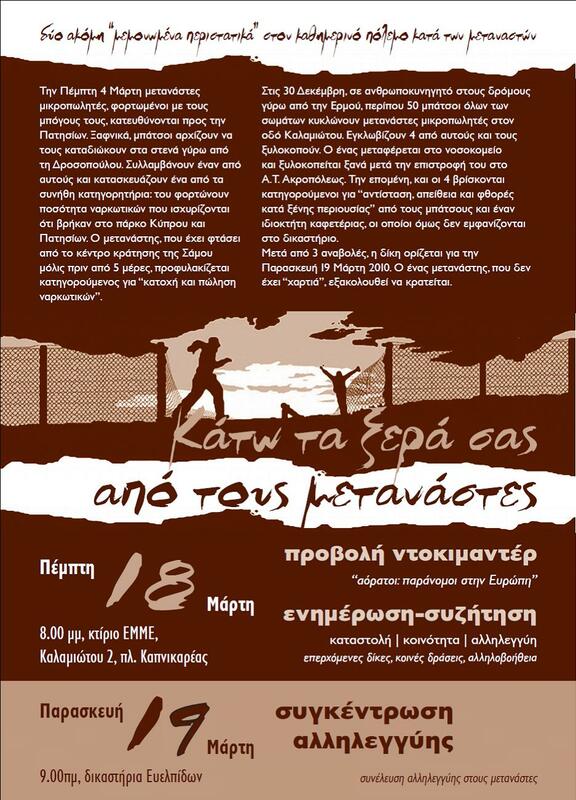 ), 9 pm SOLIDARITY GATHERING, Monday, 8 February 2010, EVELPIDON STREET COURTS, ATHENS 10 a.m.
we invite you to support en masse our action and show your solidarity. We’re on the road and we need to sell things. We want a better life. Let us unite for the common goal: solidarity and mutual aid among immigrants. In the center of Athens and Piraeus, the political and municipal authority, all kinds of cops, media and “indignant” shopkeepers engage everyone diffuse manhunts against immigrants. On December 30, 2009, ca. fifty cops persecuted immigrants in the streets around Ermou street. They pushed around and beat savagely four of them. One was taken to hospital and after his return to the infamous Acropolis police station he was beaten up again. Yet, it was the immigrants who were accused of “resistance to authority, disobedience and property damage”. The trial was postponed for February 8, 2010. One of them is still detained for not having “papers”. The fury of racist cops, the beatings, the tortures and even the murders of immigrants are not “single / isolated incidents”. It is an integral part of the daily and extensive structural violence against immigrants from the ones in power, cops and judges. Solidarity, dignity and resistance pave the road for common struggles. 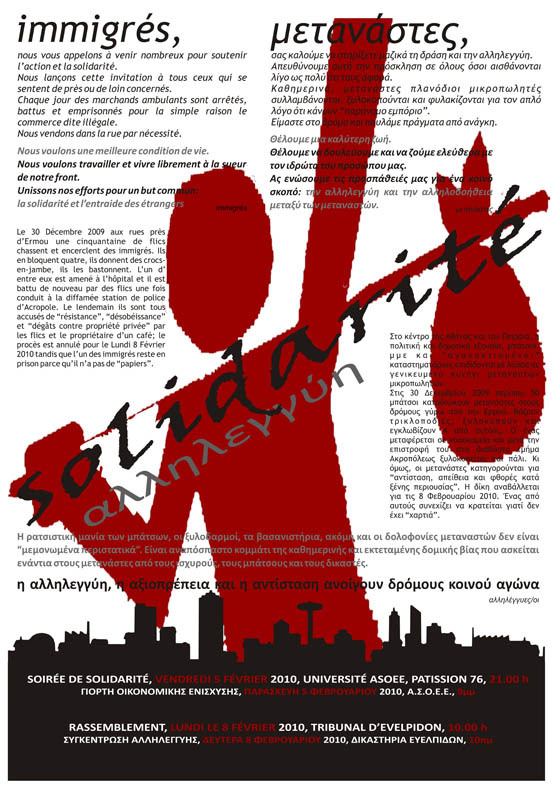 SOLIDARITY GATHERING, Monday, 8 February 2010, EVELPIDON STREET COURTS, ATHENS 10 a.m.
Manhunt against immigrant street vendors in Athens center. 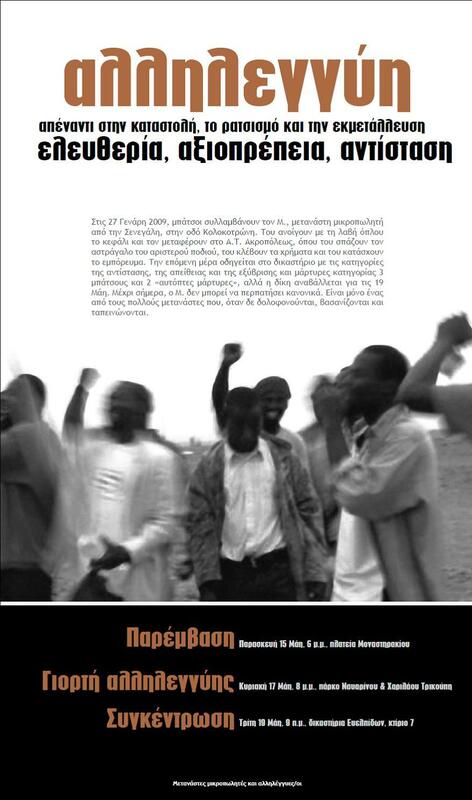 On December 23, the same day that the Chilean immigrant Pedro Navarro was arrested and tortured, African street vendors received the same treatment by police officers who participated in operations coordinated by Greek Police and the Municipality of Athens at the down-town Athens commercial streets. I was arrested by three police men and a police woman at Ermou str. They handcuffed me, then took me to a dark spot near the church of Kapnikarea and one of them hit me with his knee at the stomach by pulling my head down. Then they took me to the police station, I was in great pain and ponaga much and I vomitted. They then took me to hospital. When we left the doctors gave me some document but the police took it from me. Within the Police Station I saw one more Senegalese guy being beaten very hard. They left me free on December 30 “. “Police arrested me on December 29 at 6 to 7 pm at Ermou str. I was on my way home, I was not selling anything. I asked them ‘do you need to see my papers and they said ‘ no ‘. They threw me down and raised my leg to my head. They handcuffed me and took me on foot at the Acropolis Police Station. On the way they hit me on my mouth. I was forced to go up the stairs with handcuffs and with my hands on my back; they kept shouting and kicking me. They told their superior that they did this because I was making fuss. In the last two days in Athens downtown, particularly around the area of Ermou (High) Street, the police have launched a manhunt against immigrants street-vendors, which has resulted in numerous injuries and an unknown number of arrests. It is indicative that during a visit of comrades at a public hospital to support a wounded immigrant who had been arrested some hours ago, two more immigrants, wounded on their chests, heads and legs by the cops came at the same hospital. The immigrant is kept under detention and will be led tomorrowat the Athens Courts at Evelpidon street, accused of resistance, disobedience and property damage . Note that although he displayed his documents during the arrest, these “disappeared” after the arrest and he is now in risk of deportation. Also, on 30 Decembe at noon one more immigrant street-vendor was led to court with the usual charges cops accuse people of after beating them (resistance to authority, disobedience, etc. ); he has been released after a regular trial date was set. Solidarity tomorrow at 10.00 at the Evelpidon courts is important. There have also been reports of municipal police hunting street vendors who tide their large bikes furiously on the pavement and amidst people walking, posing serious safety threats. A special police operation against immigrants street vendors took place on Saturday at 12:00 Victoria Square and Patission Street in the center of Athens. During the operation, which lasted 20 minutes, and which was done in collaboration with the municipal police of Athens, the vendors left their merchanidise left their goods, and the cops confiscated them and transported them with 3 trucks to the warehouses of the City of Athens – probably to be shared among the uniformed employees of the mayor. Yesterday afternoon police and municipal police cops stormed down town Athens (Omonoia square) beating randomly immigrants. Municipal police kept hunting rabidly street vendors. Unfortunately, in Zinonos street some bus drivers were shouting “get them”. The police confiscated the vendors merchandise and kept beating them. When a witness (writing about it in Athens indymedia) reacted the police responded something like “get lost or you will get the same). Today at 7 in the morning the riot police squad outside the Court of Appeals building as a group kept assaulting any immigrant who exited the building alone (the whole squad against one). Bloody beating, racist swearing, threats and “don’t come back” warnings. With all this terroristic pressure by the police more and more people abandon the building everyday. There have been many reports of municipal police beating street vendors, confiscating their merchandise, stealing money and cell phones from them. (see this athens indymedia article about it). Yesterday the Public Order Minister Markoyannakis said that the police faces two major challenges: illegal immigration and the action of anarchists. He added that the police will leave aside the issue of anarchists for now to tackle the illegal immigrants issue first. For the latter, concentration camps are ready and waiting (source). His plans for cleansing down town Athens from immigrants will be concluded in one month or so from now. The sub-humans of Acropolis Police Station puke again their hatred on immigrants. It is Sunday afternoon and about five cops in the center of Athens at Ermou str. go on for their daily routine of head hunting. What they hunt is immigrants, who work in the streets as vendors. They arrest two of them, of Senegalese origin. They take them at the Police Station of Acropolis and lock them in a cell. Two hours later, 10 cops prepare themselves: they wear their gloves, open the cell, lead the two immigrants in a nearby room and begin to swear on them, kick them, punch them, hit them with police clubs. After puking their disgusting egos on them, they let the immigrants go, with bruises on the hands and feet and swollen heads. This is but one incident of the “battle of the square”, the daily trench operations of the police who hunt, beat, detain the immigrants who sell their merchandise (hand bags, accesories, dvd’s, paintings) in the street in order to survive. In this battle the Municipal Police has an active role: almost daily they assault the immigrants, beat them, confiscate their merchandise and then let them go. This is the daily terror of downtown Athens, where rights and jurisdiction are luxurious concepts. Here is a post in Athens Indymedia (in Greek) about an initiative that was formed to defend an other Senegalese immigrant who was not only abused, beaten up and robbed by the Acropolis cops, but also charged and brought to court for “resistance to authority”. Tomorrow May 19 is the trial and a solidarity gathering. The relevant poster is on the left. There are some encouraging attempts of self-organising defense on the immigrants side. Of course they meet with furious violence on the cops’s side. Here is a relevant post about an incident in Peiraieus. UPDATE of 20 MAY: The Senegalese was finally convicted with a 5 month bail sentence. The court was particularly aggressive and the decision was based solely on the testimony of cops. For the beating of the Senegalese immigrant, the judge kept saying that was irrelevant for his trial, as there will be another trial for the case. The Cops witnesses were two police officers of AT Acropolis (one woman and one man) and one Municipal policeman. The rest of the cops attending the trial were extremely invidious, and kept calling the immigrant with racist swear-words. Upon exiting the court they were appropriately vituperated by those who had come in solidarity with the immigrant . On Friday morning at the overground railway station of Piraeus at Athens the police attacked and beat a Bangladeshi vendor . Other immigrant vendors who witnessed the incident reacted solidarity to the victim of the abuse and 5 of them, of Senegalese origin, were arrested. They will stand a trial tomorrow at 1 pm, at the court of Piraeus. They are undoubtedly worthy of our solidarity.